IMMACULATE 2B/2B Discovery model home in the Prestigious GATED Peralta Trails Subdivision. Upgraded home on a CORNER LOT includes PRIVATE Front Courtyard w/Custom pavers. Interior features 2-tone paint thru out, Great Room, Den w/NEW wood plank tile & Optional Hobby Room currently as 2nd Den. Open Kitchen includes Gorgeous Granite Counters w/Under Mount sink, SS appliances, R/O drinking water, tile flooring, recessed lighting & endless cabinetry w/custom knobs. Large Master Suite w/Bay Windows, 2-tone paint w/accent wall & new wood simulated tile flooring. Large Master Bath w/raised dual vanity, tile flooring, walk-in shower & closet. 4' extended garage w/Epoxy flooring & water Softener. Back yard includes pavers, covered patio, gas fire pit, built-in BBQ & bench seating. See More. Kitchen was remodeled with lowered Breakfast Bar, white staggered brick backsplash, cabinets with pullouts, decorative glass panels in some cabinets, less than 1 year old R/O system & all appliances stay. The Great Room includes white Travertine, staggered brick TV wall with dimmable lighting and an extra window for extra lighting. Master Bath also includes a safe that will stay in the Master Closet. Large laundry room includes plenty of cabinets. Exterior of home includes sunscreens and rain gutters. PERALTA TRAILS IS A GATED SUBDIVISION. 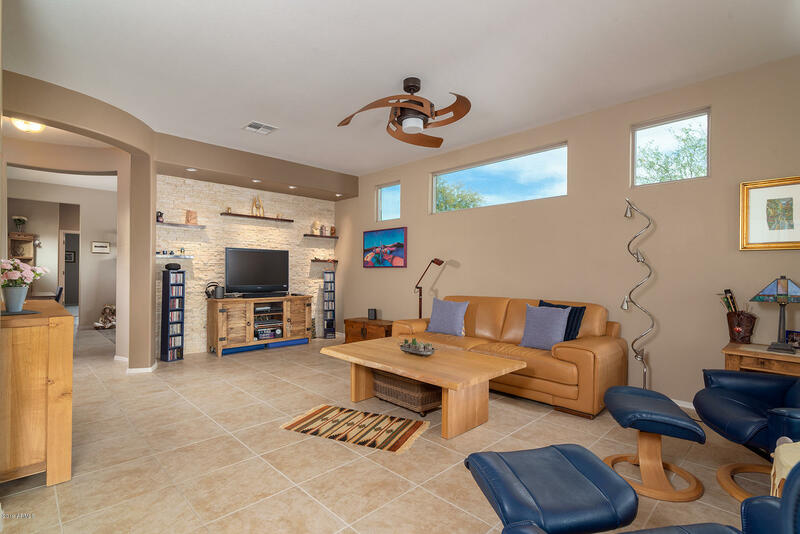 EASY CARE LANDSCAPING ALLOWS YOU TO ENJOY HIKING, ATV RIDING, EXPLORING & WILDLIFE ALL IN THE SUPERSTITION MOUNTAINS PLUS GOLD CANYON IS HOME TO 2 PUBLIC GOLF COURSES! GOLD CANYON GOLF RESORT WITH THE FAMOUS DINOSAUR AND SIDEWINDER GOLF COURSES & MOUNTAINBROOK VILLAGE GOLF COURSE. ENJOY LOCAL RESTAURANTS INCLUDING DE LA CRUZ WITH MEXICAN CUISINE, SUBWAY SANDWICH SHOP, CHEN'S CHINESE FOOD, GOLD CANYON CAFE AND OF COURSE GOLD CANYON GOLF RESORT FOR CASUAL OR FORMAL DINING. OTHER AREAS OF INTEREST TO VISIT ARE 24/7 FITNESS, JANIE'S CAFE, BASHA'S GROCERY WITH A STARBUCKS COFFEE SHOP, AND FAST FOOD CHAIN RESTAURANTS MCDONALDS AND JACK IN THE BOX. THERE ARE 3 DRUG STORES IN GOLD CANYON WITH WALGREENS BEING THE LARGEST, BASHA'S PHARMACY AND A NEW LOCAL PHARMACY FOR ALTERNATIVE MEDICINE. GOLD CANYON ALSO HAS 2 URGENT CARE CENTERS CLOSE BY, 2 FIRE DEPARTMENT STATIONS WITH PARAMEDICS AND AMBULANCES, THE SHERIFF'S OFFICE SUBSTATION, A CIRCLE K STORE WITH GAS AND PLENTY OF MEDICAL CENTERS WITH GENERAL DRS. TO SPECIALTY PHYSICIANS. HOSPITALS ARE NEARBY IN APACHE JUNCTION AND EAST MESA. GOLD CANYON IS ALSO ONE OF A VERY FEW DARK COMMUNITIES IN ARIZONA WHERE YOU CAN GO OUTSIDE AT NIGHT AND SEE THE STARS. YOU CAN'T GO WRONG CHOOSING GOLD CANYON TO BE YOUR HOME!